April 27, 2015 April 27, 2015 Nefer Khepri, Ph. D.
The Cook’s Tarot by Judith Mackay Stirt. 78 cards + guidebook. Schiffer Books, 2015. The Lovers & Hermit, from “The Cook’s Tarot” by Judith Mckay Stirt (Schiffer Books, 2015). Everyone loves to eat, right? Many of us also love to cook. Cooking is a creative process. Ingredients chosen for their harmony with one another combined by a skillful chef become a nourishing and enjoyable meal. 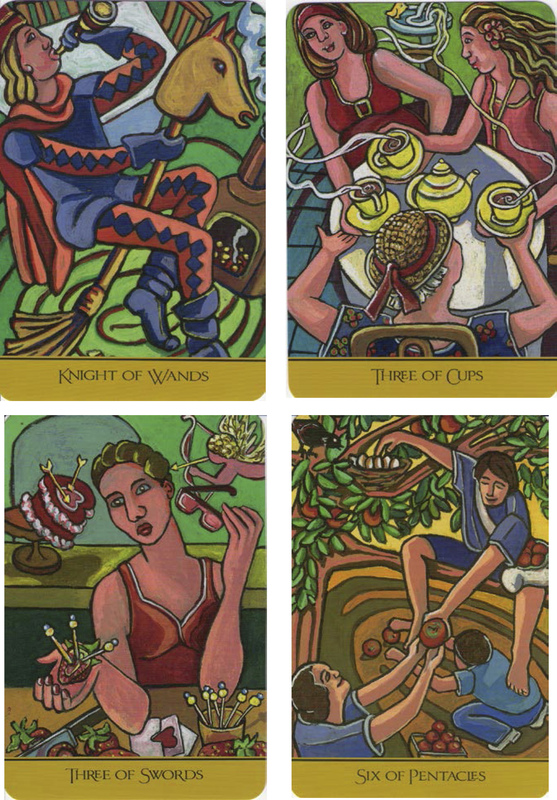 The Cook’s Tarot is the result of a 7-year long painting odyssey undertaken by Judith Mackay Stirt. Combining various symbolic elements ad her ingredients into a 78-card deck, The Cook’s Tarot honors food, the kitchen as the heart of the home, and the cook who rules over it all. 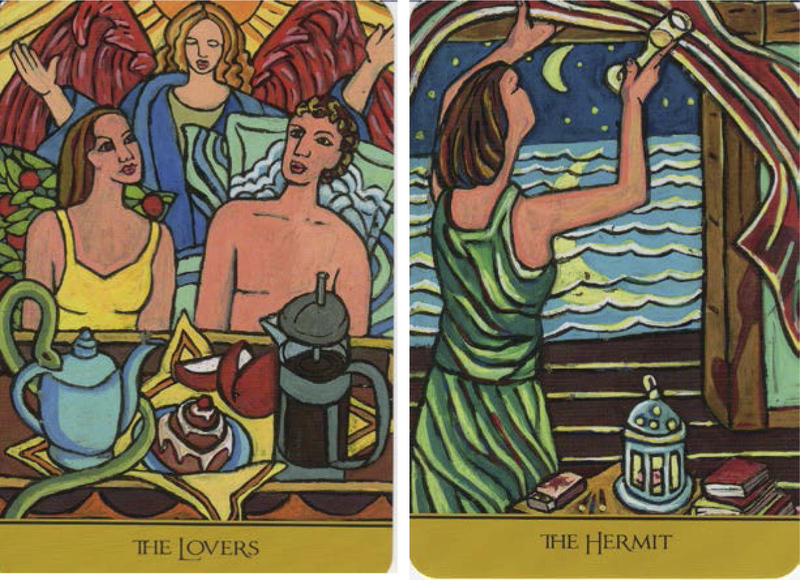 The Cook’s Tarot is a savory blend of color, form, and symbols. Each image has an energy and a life all its own. Colors are bright and vibrant while the cards are populated by all sorts of intriguing looking characters. The cards measure 3 X 5” and are borderless except for a tan border along the base of each card that contains the card’s title. Suits are traditional: Wands, Cups, Swords & Pentacles. Courts are also traditional (Page, Knight, Queen, King) and the major arcana is also traditionally titled. The Knight of Wands, 3 of Cups, 3 of Swords & 6 of Pentacles from “The Cook’s Tarot” by Judith Mckay Stirt (Schiffer Books, 2015). The cards are very flexible and made of a thin, but very nicely laminated card stock. They may be difficult for smaller hands to shuffle. The deck comes packaged in a hinged box with magnetic closure that can be stored in a bookshelf standing on its end just like a book. The lid will not fall open. The interior of the box contains two recessed wells into which two halves of the deck are housed. The 160-page guidebook rests on top of the deck inside the box. All of the components fit snugly together. The guidebook measures 6X9” as does the entire box. It contains four spreads: a 3-card spread, a 5-card spread, a 10-card spread that is the Celtic Cross, and a spread designed specifically for use with this deck – the 8-card Maitre D Spread. Card interpretations include a description of the action occurring in the image, key elements of the design, the card meaning, and concludes with a pithy piece of “kitchen wisdom” that sums up the main theme of the card. For example, the kitchen wisdom offered by The Fool is, “There is joy in cooking when you do not fear the failure.” Another example, The Moon: “We are our choices. We can choose idle hands and an overactive imagination, or busy hands and a creative mind.” Reversed meanings are not present as such, but the “shadow side” of each card is provided. The deck is enjoyable to use. I love how the colors really “pop” when used on a black reading cloth. Readings are lively and the art just seems to dance across the table. People who enjoy cooking or baking and spend lots of time in their kitchens will absolutely adore this deck. It will brighten up any kitchen and give new life to the heart of the home.